Assured Services Session Initiation Protocol (AS-SIP) is the DoD Information System Network’s standard session initiation protocol. It provides Assured System and Network Availability, and Assured Information Delivery, i.e., end-to-end Assured Services along with many other features. These include Multi-Level Precedence and Preemption (MLPP) (RFC 4412), Secure Real-Time Transport Protocol (SRTP), Transport Layer Security (TLS) on top of RFC 3261, with full support for SIP client and server applications. Our AS-SIP software is available with our comprehensive software library of algorithms and protocols to implement mobile, VoIP calling, voice and video conferencing, and multimedia applications. Contact us to discuss your specific AS-SIP application requirements. Custom designs are also available. Session Initiation Protocol is an application-layer control protocol that can establish, modify, and terminate multimedia sessions such as Internet telephony calls using Voice over IP (VoIP). SIP supports user applications that require the creation and management of a session, where a session is considered an exchange of data between an association of participants. VOCAL’s embedded libraries include a complete range of ETSI / ITU / IEEE compliant algorithms, in addition to many other standard and proprietary algorithms. Our SIP software is optimized for execution on ANSI C and leading DSP architectures (TI, ADI, AMD, ARM, MIPS, CEVA, LSI Logic ZSP, etc.). The software libraries are modular and can be executed as a single task under a variety of operating systems or standalone with its own microkernel. VOCAL’s optimized software is available for the following platforms. 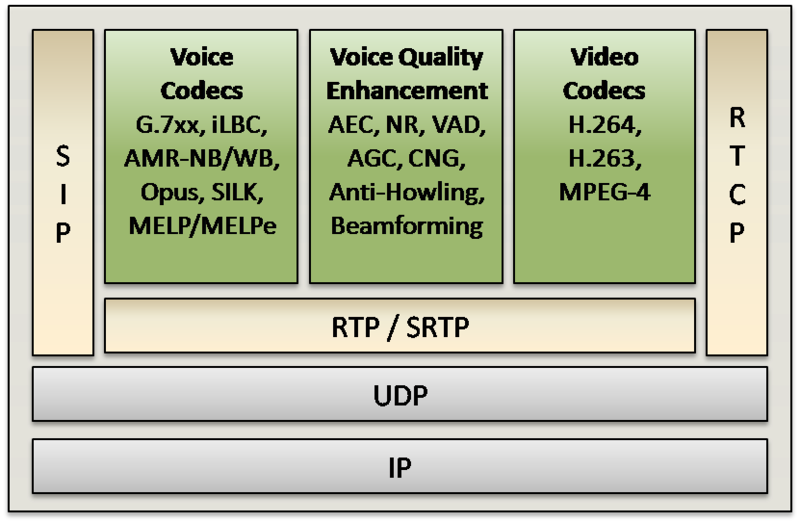 Please contact us for specific Session Initiation Protocol supported platforms.